Having notched title defense number fifteen this past weekend, Wladimir Klitschko rolls on, seemingly unbeatable, arguably the most dominant heavyweight champion since Joe Louis. His reign is viewed as “historic” and “remarkable,” and it’s impossible to argue against those two terms. Just don’t call it “greatness,” because the fact remains “Dr. Steelhammer” is not as good a boxer as some would like to think. Alexander Povetkin reminds no one of Jack Dempsey or George Foreman, but he was generally viewed as the stiffest competition available, a strong, tough battler who, it was hoped, might seriously test the champion. The match was held in Moscow this past Saturday to a huge crowd, millions watching on pay-per-view around the world. And it turned out to be a complete waste of time. Povetkin visited the canvas four times and failed to convincingly win a single round but the bout was not defined by the champion’s superior skill or power so much as by his constant holding. 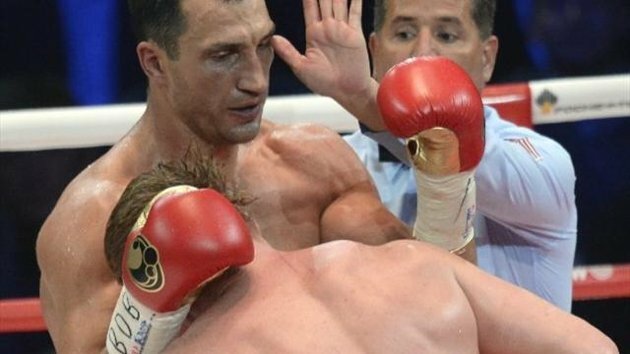 Klitschko stifled the challenger’s offense by continually clinching and leaning all over him to drain his energy. The champion, who enjoyed five and six inch advantages in height and reach and a 16 lb. weight advantage, worked to keep the challenger either at the end of his long arms or tangled up in them. While physically dominating Povetkin, at the same time the champion appeared deathly afraid of actually exchanging punches with him. He turned what might have been a competitive boxing match into a farce of wrestling and holding, his tactics hardly discouraged by the largely complacent referee. Klitschko and Povetkin spent far more time hugging than punching. One is reminded of Muhammad Ali’s second battle with Joe Frazier after which Ali, the winner by unanimous decision, took much criticism for his frequent clinching, but that was nothing. Klitschko far outdid Ali or anyone else in recent memory and besides, Ali didn’t just clinch; he also threw plenty of combinations and willingly exchanged blows with Frazier. Here it was mostly one punch at a time followed by an immediate hug. Wladimir, incredibly, even outdid that plodding master of the boring heavyweight fight, John Ruiz. Hell, one wonders if he had taken lessons from “The Quiet Man” in mauling and holding during training. If so, he was evidently a model student. Let’s be clear: this was a shameful performance. But putting aside the Povetkin debacle, the real issue here is Klitschko’s continued dominance and the fact that, increasingly, some appear to be equating that dominance with a legacy of real value. This is delusional bunk and for one simple reason: the heavyweight division is a talentless wasteland. Wladimir has no serious opposition. Klitschko has now surpassed Larry Holmes for the length of time he has stood at the top of the heavyweight division (7 years, 3 months) and he is on his way to overtaking Holmes in terms of successful title defenses. But there can be no disputing the fact that the quality of opposition Holmes faced in his 20 championship wins far exceeds Klitschko’s, even though Holmes presided over, historically speaking, a rather weak division. That said, do any of Klitschko’s opponents measure up to say Mike Weaver? Or Tim Witherspoon? Or Ken Norton? 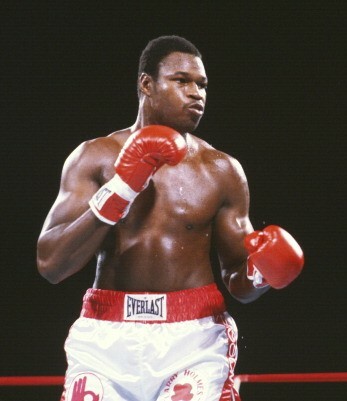 Hell, I’d take Trevor Berbick in a heartbeat over David Haye, Lamon Brewster and Samuel Peter, to name three of Wladimir’s more formidable challengers. And Earnie Shavers might have been over the hill when Holmes beat him twice, but that version of “The Black Destroyer” would make quick work of almost every other name on Klitschko’s record. Holmes faced much stronger opposition. Wladimir’s fans point to his impressive physique as evidence of his superiority. They argue that his huge advantages in size and weight would make him unbeatable for smaller heavyweights, such as Jack Dempsey, Rocky Marciano or Joe Louis. This speaks to a misunderstanding of the sport. Boxing, when practised at the elite level, has little to do with size or muscles. It’s much more about timing, precision, distance, balance and the ability to respond to your opponent’s tactics. Not to mention durability, an aspect of the game which has not been one of Wladimir’s strong points. Knockout losses to Corrie Sanders and Lamon Brewster will forever undermine “Dr. Steelhammer’s” standing. More to the point though, the greats of the past paid little attention to weight disadvantages. Sam Langford rarely weighed over 165 lbs. in his prime but he fought and knocked out heavyweights on many occasions. Likely the greatest flyweight who ever lived, Jimmy Wilde, had no fear of larger men. Back in 1918 he gave up 20 pounds to Joe Conn but knocked him down six times and stopped him in round 12. It was the same for Joe Walcott or Harry Greb or Henry Armstrong, because the true ring greats understood that boxing was brains over brawn. Besides, it’s not as if we haven’t had giant-sized heavyweights in the past. Challenger Buddy Baer had similar dimensions to Klitschko, standing 6’7″ and weighing 240 pounds; a much smaller Joe Louis knocked him out twice. Primo Carnera weighed a whopping 263 pounds, but that didn’t stop Max Baer, 54 pounds lighter, from knocking him down eleven times before scoring a stoppage win. Jack Dempsey gave away 58 pounds to 6’6″ Jess Willard but their bout was a massacre. 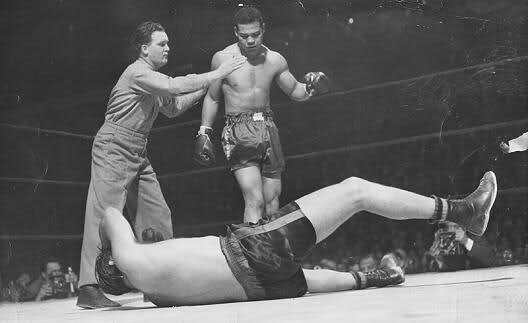 Dempsey scored seven knockdowns in the opening round; a battered and bleeding Willard surrendered after the third. As the saying goes, the bigger they are, the harder they fall. Joe Louis stands over 6’7″ Buddy Baer: giant sized heavyweights are nothing new. Of course it’s not Wladimir Klitschko’s fault that he has few, if any, opponents of true quality and talent. It just so happens that we live in a time when the sport of boxing is in decline, has been now for decades. Back in, say, the 1930s and 40s, every major city in North America had any number of boxing gyms plus fight clubs featuring live cards literally every weekend. Boxing was part of the fabric of everyday life in America and hundreds of thousands of men tried their hand at it. It was a respected sport at universities and the Golden Glove tournaments were major events. And in all the gyms were dozens of experienced trainers and managers, most of them former prizefighters, men who knew something about the technique of boxing and the tricks of the trade. That’s all gone now and in any case, gifted athletes today are far more likely to turn to football, track, hockey or baseball, sports which offer college scholarships and tangible benefits. The simple but unpleasant truth is that boxing simply isn’t what it used to be. The sport is in a dark age, a time of mediocrity and ignorance. And this is why a fighter like Wladimir Klitschko can dominate the heavyweights. It’s not because he’s great, or even very good. It’s because he happens to be better than everyone else in his division at the present time. Which, when you think about it, isn’t really saying much. All of Klitschkos opponents would defeat greats of the past… this article is just a bunch of nostalgia driven crap.